In the wake of the disappointing market reaction to the Cyprus deal, I just want to repeat the comment I hear from some of my European contacts: "You just don't understand Europe." The chairman of the group of eurozone finance ministers warned that the bailout marked a watershed in how the eurozone dealt with failing banks, with European leaders now committed to “pushing back the risks” of paying for bank bailouts from taxpayers to private investors. Jeroen Dijsselbloem, president of the eurogroup, was speaking after Cyprus reached its 11th-hour bailout deal with international lenders that avoids a controversial levy on bank accounts but will force large losses on big deposits in the island’s top two lenders. I believe that bailouts of other eurozone countries, should they be necessary, will conform to a different template of conditionality other than the imposition of a tax on bank deposits. For example, the ECB has made it clear that it will backstop Spain, but on condition that the government undertake structural reforms and austerity. In the case of Spain, Rajoy has yet to swallow the bitter pill that comes with an OMT bailout. The ECB stands by to hold everything together if the above two steps are taken. WSJ: Which do you think are the most important structural reforms? Draghi: In Europe first is the product and services markets reform. And the second is the labour market reform which takes different shapes in different countries. In some of them one has to make labour markets more flexible and also fairer than they are today. In these countries there is a dual labour market: highly flexible for the young part of the population where labour contracts are three-month, six-month contracts that may be renewed for years. The same labour market is highly inflexible for the protected part of the population where salaries follow seniority rather than productivity. In a sense labour markets at the present time are unfair in such a setting because they put all the weight of flexibility on the young part of the population. WSJ: Do you think Europe will become less of the social model that has defined it? Draghi: The European social model has already gone when we see the youth unemployment rates prevailing in some countries. These reforms are necessary to increase employment, especially youth employment, and therefore expenditure and consumption. Draghi: You know there was a time when (economist) Rudi Dornbusch used to say that the Europeans are so rich they can afford to pay everybody for not working. That’s gone. Unlike Dijsselbloem, who is a rookie, Draghi is an experienced central banker who chooses his words carefully and he reveal his agenda in February 2012. Investors looking at Europe should remember that. If you understand the Draghi Grand Plan, then you will understand how the eurocrats are likely to react when the next sovereign crisis occurs. First, the ECB will "do whatever it takes" to save the eurozone, but help from Frankfurt (the ECB) and Brussels (EU) comes with strings. In all likelihood, the eurocrats will believe that the country seeking help needs austerity and structural reform. In such a case, be the price to be paid will be paid is austerity and structural reform and the solution will not to stiff bank depositors (think Spain as an example as Rajoy's reluctance to embrace Draghi's "conditionality"). The kind of "conditionality" demanded by the ECB and is therefore highly situation specific. Cyprus was truly a unique case. Don't expect the same template to be used for Spain or Portugal. That's where outsiders make the mistake. Investment implicationsLast week, I wrote that I was watching the relative returns of Greek stocks to eurozone stocks as a barometer of the level of stress in Europe, largely because of the Greek-Cypriot link and because Greece is the high beta play in Europe. When I looked last night, GREK had tanked relative to FEZ and had violated an important level of relative support. The Athens Index had also dived relative to eurozone stocks. Though the degree of relative performance was not as bad, it is nevertheless a cautionary signal for the risk trade in Europe. The negative market reaction over Cyprus suggests to me that we are going to go through a "the glass is half empty" cycle in Europe and traders should be prepared accordingly. 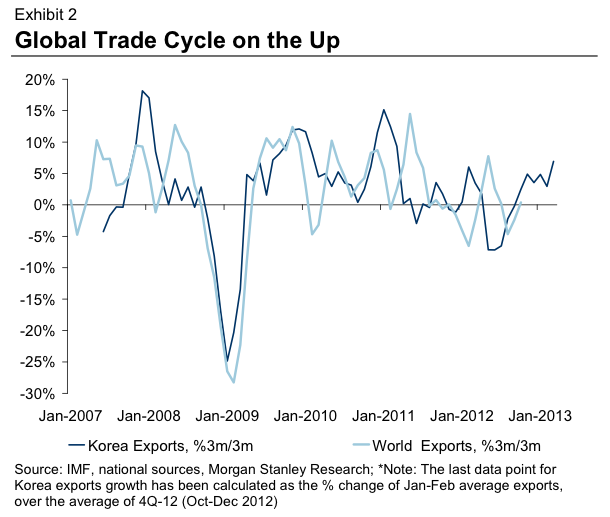 The key indicators to watch is the performance of France. France is the elephant in the room. The French economy is suffering a negative divergence with Germany. 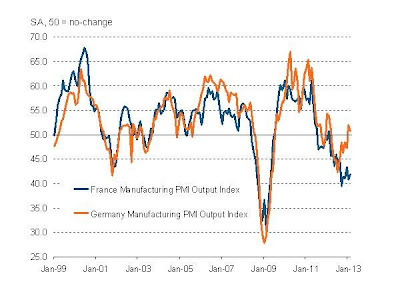 Consider this graph of French and German PMI (via Business Insider). European governments that have undertaken big reforms have done so because there was a deep sense of crisis, because voters believed there was no alternative and because political leaders had the conviction that change was unavoidable. None of this describes Mr Hollande or France. During the election campaign, Mr Hollande barely mentioned the need for business-friendly reform, focusing instead on ending austerity. His Socialist Party remains unmodernised and hostile to capitalism: since he began to warn about France’s competitiveness, his approval rating has plunged. Worse, France is aiming at a moving target. All euro-zone countries are making structural reforms, and mostly faster and more extensively than France is doing (see article). The IMF recently warned that France risks being left behind by Italy and Spain. At stake is not just the future of France, but that of the euro. Mr Hollande has correctly badgered Angela Merkel for pushing austerity too hard. But he has hidden behind his napkin when it comes to the political integration needed to solve the euro crisis. There has to be greater European-level control over national economic policies. France has reluctantly ratified the recent fiscal compact, which gives Brussels extra budgetary powers. But neither the elite nor the voters are yet prepared to transfer more sovereignty, just as they are unprepared for deep structural reforms. While most countries discuss how much sovereignty they will have to give up, France is resolutely avoiding any debate on the future of Europe. Mr Hollande was badly burned in 2005 when voters rejected the EU constitutional treaty after his party split down the middle. A repeat of that would pitch the single currency into chaos. I am watching closely this ratio of the CAC 40 to Euro STOXX 60 to see which way it breaks out of the relative consolidation range. If it rallies through upside relative resistance, then any crisis is just more theatre and can be regarded as a buying. On the other hand, if it breaks to the downside, there's going to be trouble. I suppose that I should be happy. I correctly turned bullish on a tactical basis (see Give in to the Dark Side). I correctly called the Cyprus mini-crisis (see Don't get too excited about Cyprus and More of the usual Eurocrisis drama). As I write these words, the news of the Cyprus deal is sparking a modest risk-on rally. Over here on this side of the Atlantic, the American economy continues to chug along, despite the sequester and payroll tax hike. I agree with Tim Duy when he writes that the recovery is real. When I reviewed my charts on the weekend, I came away vaguely dissatisfied. The relative performance of industries and sectors reveal a market whose leadership that is increasingly turning away from cyclical groups and toward defensive sectors and a "negative beta" group. 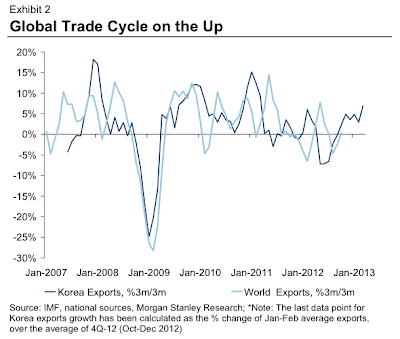 If we are seeing such a bullish outlook (Europe, US economy), why are cyclically sensitive sectors not doing better. Consider the relative performance of Consumer Discretionary stocks against the market. This sector is currently seeing a sideways consolidation after stalling out of a relative uptrend that began last August. On the other hand, defensive sectors are starting to take the leadership position. Why are they outperforming when the stock market is advancing? HUI has already staged a relative turnaround against bullion as it has strengthened through the relative downtrend against gold. Gold and gold stocks have somewhat defensive characteristics as they have had a zero or negative correlation against the SPX in recent weeks. Their revival could be a warning sign for stock bulls. My inner investor continues to be concerned about this market advance. 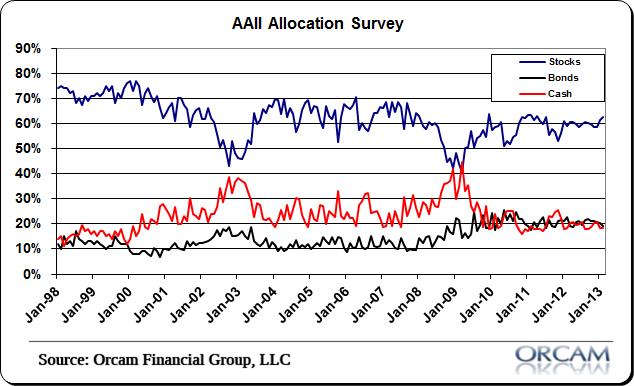 He believes that the prudent course of action would be to move his portfolio asset allocation to its policy weight, i.e. if the policy weight is 60% stocks and 40% bonds, then the portfolio should be at 60/40. 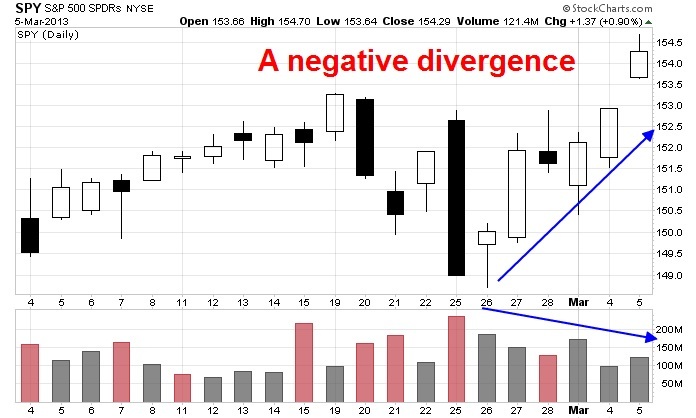 At the time, my inner trader wanted to throw caution to the winds and get long the market. Now, my inner investor is telling him, "I told you so." Under these circumstances, my inner trader is getting very, very nervous and he is tightening up his trailing stops. The behavior of these sectors is flashing warning signals that if even if this market were to rally further, the advance could be very choppy. Until we see some evidence of upside relative breakouts of consolidation ranges in cyclical sectors and industries, these market internals should make anyone who is bullish an uncomfortable bull. So the Cypriot parliament has rejected the terms of the Troika's rescue deal. Their finance minister is in Moscow and there were stories floating about that the quid pro quo for a Russian rescue of Cyprus would be a Russian naval base (via Business Insider). Should the EU and NATO be concerned? The wild card that I had been watching for is for Greece to turn to Russia instead of the Troika for financing. What if the Greeks got tired of the pain and turned to Putin for relief? Moscow has long had a historical desires for the warm waters of the Mediterranean for centuries. A financing deal could have shook up NATO and significantly shifted the geopolitical balance in the Eastern Med. The Russian government last year gave Cyprus a three-year loan of 2.5 billion euros, or $3.1 billion at the current exchange rate, at a below-market rate of 4.5 percent to help it service its debt. Cyprus now needs at least 1.8 billion euros, or $2.3 billion, by the end of this month to buttress its ailing banking sector. Now many on this tiny island nation, whose banks and government are facing economic insolvency, are hoping for financial salvation from Russia rather than Germany and the European Union. Cyprus would have been the test case of Russia flexing its financial and geopolitical muscle in the Eastern Med. Today Nicosia, tomorrow Athens? Can you say "Russian Black Sea fleet base in Athens, or Crete"? The Government of the Republic of Cyprus informed on the 25th of June 2012 the appropriate European Authorities of its decision to submit to euro area Member States a request of financial assistance from the EFSF/ESM. Any talk of a rescue from Moscow is likely just that - talk. The Russians demonstrated their lack of interest in November when they had the chance. 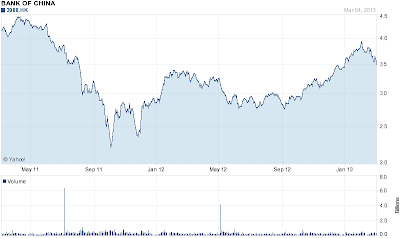 Here is what I am watching for as signs that the markets believe that the Cyprus crisis is getting out of hand. The chart below shows the relative return of the ETF of Greek stocks (GREK) against large cap eurozone stocks (FEZ). The GREK/FEZ ratio has declined and it is testing a relative support zone. Should it break support, then it's time to get more cautious. I use this ratio for two reasons. Cypriot banks are highly exposed to Greek debt. As well, the Greek stock market is the high beta "canary in the coalmine" of risk in the eurozone. So take a deep breath and relax. The headlines represent the usual European negotiation drama in a crisis, with one or both sides leaking stories of catastrophe should there be no agreement. On the other hand, the message from the markets is that this crisis will be resolve in a relatively benign manner. Listen to the markets. Calm down. The financial markets sold off early Monday on the news of the weekend bailout of Cyprus, but while the risks of a financial meltdown, while real, they are overly exaggerated. As I write these words, US equities have recovered most of their losses and shrugged off the Cyprus news. To explain what happened, Cypriot banks got in over the heads with too much Greek debt and had to be rescued. The EU stepped in with a €10 billion rescue package, but with the conditionality that the government impose a 6.75% one-time levy on bank deposits under €100,000 and 10% for deposits over €100,000. The deal has yet to be ratified by the Cypriot parliament. If it isn’t, banks in Cyprus are certain to collapse and there are reports about how the deal is going to get modified. The knee-jerk reaction was instantly negative. The fear is that if this can happen in Cyprus, it could happen elsewhere. What if Portugal, Spain or Ireland had to get bailed out, would depositor funds be at risk there too? What’s to stop the Portuguese, Spanish and Irish from pulling their euros out of their banks and putting into Deutschebank in Frankfurt, thus sparking an enormous bank run and threatening the health of the European banking system? There are some institutional impediments against bank runs within the eurozone. Some countries impose daily withdrawal limits, ostensibly as a measure against money laundering. Nor is it easy to open a bank account in a foreign country. In many cases, you need to have residency. You may need to travel there in person, and you need to speak the local language – or at least English. While it is possible to get around these rules, the risks of a bank run that threatens the health of the banking system are low. In addition, ECB head Mario Draghi has said in the past that he would do “whatever it takes” to save the eurozone. However, he has also made it clear that rescues come at a price. The Cypriot rescue conforms with the EU and ECB principle of the imposition of “conditionality” on rescues. In the case of Cyprus, the banks had insufficient equity to withstand the shock of a write-down of Greek debt and it didn’t have enough senior bond holders to cushion the pain without rendering the banking system insolvent. The only ones left to take the hit were the depositors. It didn’t hurt politically that Cyprus was known as an offshore banking haven, mainly for Russian oligarchs. So it was easy for Angela Merkel to sell a bailout involving shared pain to the German people. Based on my analysis, the worst fear of the pessimists, which is a bank run in the eurozone, will not materialize. However, there are two key risks to this forecast. First, I am assuming that the Cypriot parliament will approve the rescue package and approval isn’t fully assured. If the deal were not to be ratified, it would likely introduce a new element of risk to the eurozone banking system and possible contagion into the global banking system. In that case, all bets are all. The second is the French elephant in the room. The French economy is negatively diverging from Germany and France needs to take steps to align itself with Germany and the core eurozone economies. While the EU can rescue Greek and Cyprus, France is at the heart of the EU and much too big to save. Will Cyprus spark a turnaround in metals and mining? The blogosphere is full of comments about the Cypriot bailout on the weekend (for examples, see How to start a banking crisis, Cyprus edition and The Cyprus conspiracy II). Instead of writing about Cyprus, a topic that I have no special expertise in, I thought that it would be timely to write an update to my blog post on February 19 about the resource-based sectors (see Time to buy gold and commodity stocks?). Since I wrote that post, the metals and mining stocks have begun to stage a turnaround. To recap, the mining group is showing signs of being overly beaten up and washed out. This chart of XME, the mining ETF, against the market shows that it is trading at or near investor capitulation levels relative to its long-term history. Take a look at the shorter term one-year relative chart of XME vs. SPY. The miners are starting to show some positive relative strength against SPY. Is that the sign of a nascent recovery? Similarly, gold stocks are highly unloved against bullion. I have not been a big fan of buying gold stocks for gold bulls (see Where is the leverage to gold? ), but in this case a long gold stock/short bullion position is likely to have much better risk/return profile than any time in the recent past. Shorter term, however, my inner trader is still watching this pair of a relative turnaround as the HUI/Gold pair remains in a relative downtrend. On the other hand, I can't say I am overly bullish on gold itself. The silver/gold ratio, which is a measure of the speculative interest in precious metals, is stuck in the middle of its historical band indicating neither excessive bullishness nor excessive bearishness on the PM complex. 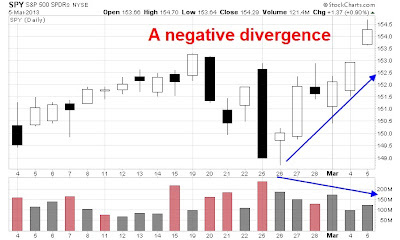 Nevertheless, I am seeing signs of a capitulation, or washout, in investor sentiment. Here in Canada, the chart of the junior Venture Exchange Index against the more senior TSX Index shows that the ratio is at or near levels indicating investor capitulation in the juniors, which are mostly junior resource companies. Not enough energy in Energy? In my last post on this topic, I was more constructive on the energy sector as the sector was showing signs of a relative strength turnaround. Since then, the sector remains range-bound against the market and appears to be consolidating sideways on a relative basis. The price of Brent crude confirms my observation about the range bound, or sideways consolidation pattern shown by energy stocks. At this point in time, the energy sector may not have enough energy, or momentum, to present itself as the new emerging leadership sector. As I write these word, the markets have a risk-off reaction over the Cyprus news. EUR is plummeting against all currencies and against JPY in particular; USD is up: ES is falling and gold is up marginally but a base metal like copper is down. While the initial market reaction isn't necessary the sustainable reaction, the Cypriot event may serve as a catalyst for the resource sectors (and the metals in particular) to stage a turnaround and present themselves as the new market leadership. It will also prove to be an important market test for the price of gold (and the gold bugs), to see whether investors flock to USD assets or to gold in this instance of an unexpected eurozone confiscation tax of banking depositor assets. Is the secular bull market in Vancouver RE over? I don't generally comment on the local residential real estate scene, largely because the topic isn't within the scope of this blog and I don't have much in the way of unique insights. However, I have a personal interest since I live here. In addition, several items came across my desk that piqued my interest. While statistical relationships do not indicate causality, anecdotal evidence suggests that Vancouver property prices have been buoyed over the last couple of decades by several waves overseas buyers. The first was from Hong Kong, followed by the Taiwanese and now the Mainland Chinese. I came across an item Friday in the WSJ indicating that the older generation of Mainlanders looked to North America if they intend to emigrate (or at least to get a foreign passport), but the new generation is considering other alternatives such as Singapore, Hong Kong and Cyprus (see video and article). In particular, this wave of "economic refugees" seeking foreign passports as a safety valve should things turn south at home are looking to troubled eurozone jurisdictions such as Cyprus, where you can get a residency permit if you buy property there (and apply for Cypriot, and therefore EU, citizenship after five years). Other eurozone countries like Spain, which saw the collapse of a property bubble, also has a residency for house purchase program. So what happens if Mainland Chinese demand starts to decline? The Conference Board study indicated that the health of the local economy had little or no effect on local property prices. In other words, the locals have been priced out of the market. At what price does local demand start to put a floor on the market? Here are some back of the envelope numbers. A typical single-detached house on upscale neighborhoods on Vancouver's westside goes for about $2 million, give or take. If you were to open up the career section of the local paper, a good paying job is roughly 50-80K a year. Let's assume that you have a couple with a combined household income of 200K a year - which would roughly puts them in the top 2% in Canada. Assume that they have no other equity from an existing home but have the 20% down payment, they can afford a house of $1.0-1.2 million range based on current interest rates. That's where local demand starts to kick in. Sales recorded through the Multiple Listing Service dropped 24 per cent in February to 4,501 transactions compared with 5,895 a year ago, the report said. The provincial average price was $529,922 in February, down 8.1 per cent from February 2012. ...the concern is that the overseas buyer is looking elsewhere is a threat to the secular bull market in Vancouver residential property prices. Should that happen, market price trends will transform itself from a series of higher lows and higher highs to a more cyclically driven market where prices move up and down with the economic cycle. Right now, I am watching China (for cyclical effects on Vancouver RE prices, as per the Conference Board study) and emigration preferences (for the secular effects). Economic growth was beginning to re-emerge in the 17-nation euro currency area, the Organization for Economic Cooperation and Development (OECD) said as it released key economic indicators Monday. The recovery in Europe's biggest economy, Germany, had pushed up an OECD indicator for the eurozone designed to identify turning points in the business cycle, said the organization, which represents senior Western industrialized nations. The economic clouds are lifting and such an environment is supportive of further gains in equities (see my last post Give in to the Dark Side). Further to my last post (see An unconvincing breakout), stocks have continued to move higher. I continue to be concerned about this advance. 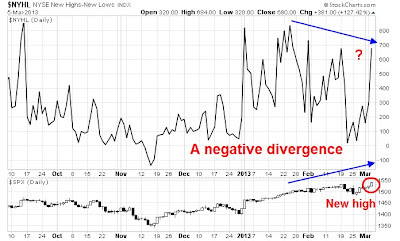 The negative divergence (update link here) that I outlined is still not confirming this rally. Moreover, heavy insider selling is generally not a good sign for the bulls (see Insider selling, it's baaack! and this update from Bloomberg). Nevertheless, stocks continue to move up and sometimes it's more important to analyze the reaction to the news event than to analyze the news event itself. The market has shrugged off concerns over sequestration cuts to the US federal budget, as well as concerns over how political paralysis in Italy might affect the integrity of the eurozone. In fact, the storm clouds are lifting. First of all, the House of Representatives passed a bill to avert a March 27 government shutdown and kick the can down the road to September 30. No doubt there will be further horse trading in the Senate, but the risk of a near-term fiscal catastrophe is fading in the United States. Grillo’s great accomplishment thus has been to make everyone think hard, Italians themselves most directly, but almost as much all the EU technocrats and attendant financiers. Perhaps that's what the bond market is saying: Grillo won't last. My inner trader is also pointing to an improvement in sentiment readings. 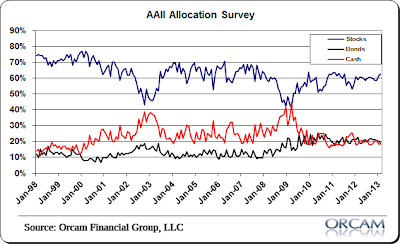 The AAII sentiment survey (via Bespoke) shows that bullish sentiment collapsed in the wake of the Italian elections - a contrarian bullish reading. My inner investor continues to be concerned about this market advance. He believes that the prudent course of action would be to move his portfolio asset allocation to its policy weight, i.e. if the policy weight is 60% stocks and 40% bonds, then the portfolio should be at 60/40. In particular, he is worried about the bearish portends of insider selling. Even if equities were to advance here, Sam Stovall's analysis of what happens after the market hits a new high (via Business Insider) indicates that the upside is limited while downside risk is high. If history is any guide, for it's never gospel, it may respond like the messenger from Marathon. In other words, the S&P 500 may have little time to rejoice following the setting of a new record high before collapsing again, as the median advance following the recovery to break-even from bear markets since WWII has been only 3% before stumbling and falling into another meaningful decline within only two months. To chase stocks here would be giving in to the Dark Side. My only answer to this is that both D-J Averages produced something never seen before, namely new highs during a post-crash upward correction. My explanation of this unprecedented situation is that the advance to new highs was a direct result of never-before-seen manipulation by the Federal Reserve. The Fed was able to engineer new post-crash highs in both D-J Averages. But I doubt if the Fed will be able to engineer a coming new era of prosperity in America. Thus, it will be an example of where the stock market will not be predicting the nation's economic future. As a matter of fact, I believe this stock market is predicting a very mixed and confusing economic future for the US. As far as I can see, the Fed will be pumping in QE-to infinity for as long as it can get away with it. The only thing that might halt the Fed is rebukes from voting members based on it's outrageous 3 trillion dollar balance sheet. We're in uncharted territory in my opinion, and I expect to see a number of events in both the stock market and the economy which will be both surprising and upsetting. One technical observation -- With the breakout and confirmation by the Industrials, this places tremendous psychological pressure on the 13.108 million shorts that are now positioned on the NYSE. As a result, we should see irregular spates of short covering or buying panics, depending on the fears and psyches of the short sellers. This makes shorting stocks in this market a risky game. My view for the future -- erratic market action along with a disappointing US economy. Incidentally, I don't know if you noticed, but some of the heavily shorted stocks surged yesterday, due, in part, to frantic and fear-filled short covering. My inner trader, on the other hand, says to listen to the market and go with the momentum. The US economy seems to continue to improve despite concerns about the payroll tax increase and sequestration cuts. Last Friday's Non-Farm Payroll number was an unambiguously positive release. In addition, indicators such as rail traffic point to continued growth in the economy. So it may be the time for my inner trader to take a walk on the Dark Side and get long this stock market, though with tight stops. I have a suggestion for those who want to take that walk on the Dark Side. While the logical course of action may be to buy cyclically exposed stocks and industries such as the Materials sector which seems to be staging a bottom (see Time to buy gold and commodity stocks), here is an even Darker suggestion. Holder’s admission bolsters criticisms that federal prosecutors are deeming some banks “too big to jail,” a charge that lawmakers and consumer advocates have routinely made in the wake of recent bank settlements. Although the government has issued record multimillion-dollar fines in these cases, critics say without criminal charges, the agreements amount to a slap on the wrist. Robo-signings? Banks are systemically important. Robo-foreclosures? It's just a few bad apples. LIBOR scandal? No problem. That, my friends, is considered to be an unassailable competitive advantage for the financials. The real walk on the Dark Side is to buy the large cap financials, not despite, but because of their propensity for financial shenanigans. Consider this chart of the relative performance of the financials against the market. This sector broke out of a long-term relative downtrend in early 2012 and they have begun a relative uptrend. The benefit of being long this sector is that it provides a less cyclical exposure to the stock market and will partially insulate the trader from a downturn in the economy. In any case, if you are going to take a walk on the Dark Side, you might as well go all-in. Breakout or fakeout? The Dow hit an all-time high yesterday, but I found the breakout technically unconvincing as it was unaccompanied by negative divergences. First of all, the upside breakout was achieved on low volume and volume had generally been declining since this advance began on February 26. In addition, the chart below of NYSE new highs - new lows is not confirming the advance either. 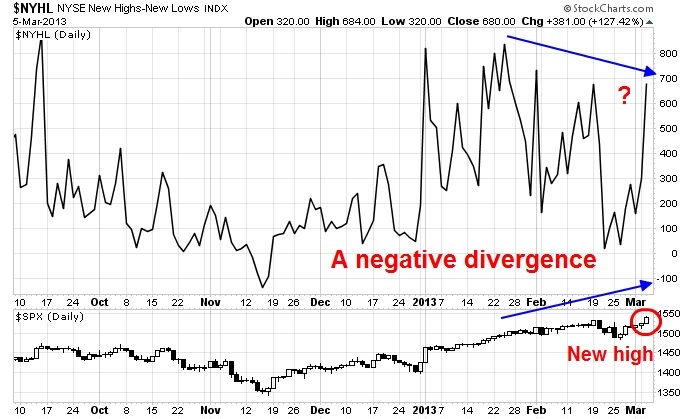 The NH-NL differential achieved a recent high on January 24, but the current upside breakout saw a lower NH-NL differential, which is another negative divergence and a sign of bad breadth. 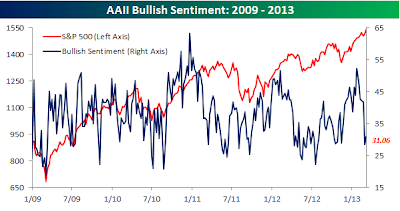 ...indicating that sentiment at bullish extremes, these readings brings up the question of how much longevity the current advance is likely to have. An update on my Chinese "canaries"
In the past week, I have received several emails in the wake of the 60 Minutes story about the Chinese property bubble and the news that China had unexpected implemented curbs to limit property speculation (via Bloomberg:), the Shanghai market tanked. China’s cabinet on March 1 told cities with “excessively fast” price gains to raise down-payment requirements and interest rates on second-home mortgages and ordered individuals selling properties to “strictly” pay a 20 percent tax on the sale profit when the original purchase price is available, a levy that is being easily avoided. The People’s Bank of China’s regional branches may implement the measures in accordance with the price-control targets of local governments, the central government said in a statement on its website. Cities facing ‘‘relatively large” pressure from rising house prices must further tighten home- purchase limits, according to the statement. The share have pulled back a bit from its recent highs, but show no signs of cratering. Let me make this clear, these stocks are barometers of trouble in the official and unofficial banking system in China and but they are only indicators of catastrophic breakdown. 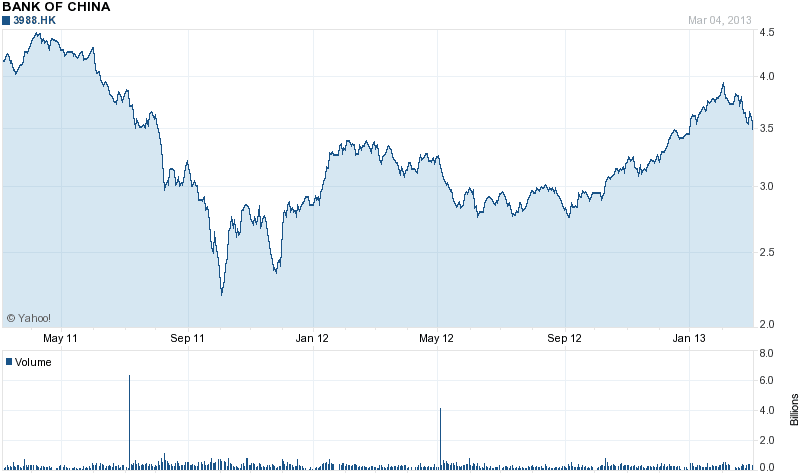 Don't be overly concerned until the share price at least probes its 2012 lows. The sign to head for the foxhole is when the shares start to test its all-time lows. As I write these word, the Shanghai Composite is staging a rally and recovering some of its losses. So relax and don't worry about little squiggles in the share prices. Is this 2011 all over again? Looking at a longer time frame paints a bearish picture as well. The eight week sell-buy ratio from Vickers stands at 5-to-1, also the most bearish since early 2012. What's more, the last time this ratio was at these levels was June 2011, just before another correction in the stock market took place. While retail is being told to buy-buy-buy, Biderman exclaims that "insiders at U.S. companies have bought the least amount of shares in any one month," and that the ratio of insider selling to buying is now 50-to-1 - a monthly record. "So far the mass delusion is holding." There were about 12 stock-sale announcements over the past three months for every purchase by insiders at Standard & Poor’s 500 Index (SPX) companies, the highest ratio since January 2011, according to data compiled by Bloomberg and Pavilion Global Markets. Whenever the ratio exceeded 11 in the past, the benchmark index declined 5.9 percent on average in the next six months, according to Pavilion, a Montreal-based trading firm. 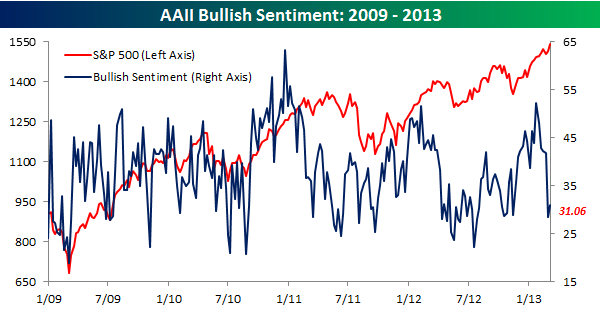 Regardless of differences in methodology, the results are an ominous sign for the bull camp. Another similarity between today and the summer of 2011 is the rising anxiety over the consequence of political intransigence in Washington. Then, we saw the debt ceiling crisis of 2011, which led to the loss of the AAA credit rating from Standard and Poor's. A 0.6% slowdown in GDP growth could very well mean that the economy stalls and keels over into recession. What's more, another debt ceiling debate with a drop-dead deadline of March 27 will pour gasoline on the fire and could lead to further market anxieties. In 2011, the ECB's announcement of its LTRO program stabilized the markets. Mario Draghi's "whatever it takes" remark in July 2012 and the ECB's subsequent OMT program contributed to further stabilization. Today, the market consensus has evolved to the view that the ECB has taken tail-risk, or the risk of a European sovereign debt or banking crisis, off the table. The ECB, it seemed, had built a financial castle wall around the eurozone again. Read the fine print. The OMT program depends on member states submitting to the ECB's "conditionalities", namely austerity and structural reform programs. 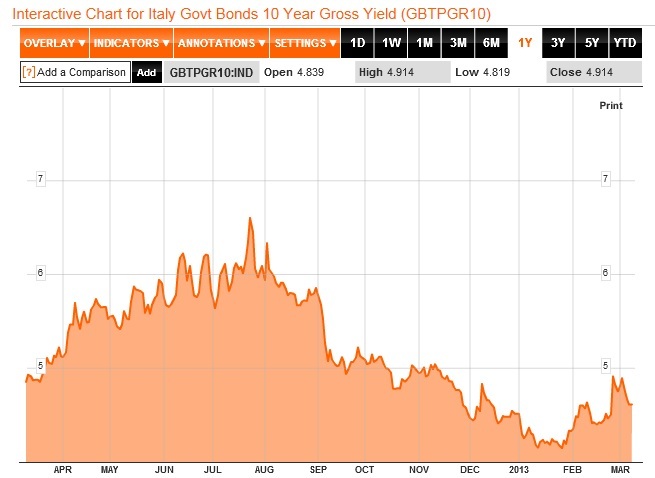 The rise of anti-euro forces in the recent Italian election shows how fragile the ECB's castle walls really are. The divergence between German and French economies (via Business Insider). This divergence is starting to raise the question of the viability of the French-German partnership in the EU. These are the two principal founding partners in the European Union and brings up the question of wage and productivity differentials between the two countries. If the two economies can't converge and Germany is unwilling to subsidize France, the euro is cooked. Nothing else matters. It doesn't matter what happens to Greece, Spain, Ireland, etc. The Spanish government has launched a legal challenge against Catalonia’s recent “declaration of sovereignty”, in the latest move by Madrid to halt the region’s march towards independence. The government said it would ask Spain’s constitutional court to nullify the Catalan parliament’s January declaration, which stated that the “people of Catalonia have, for reasons of democratic legitimacy, the nature of a sovereign political and legal subject”. What's more, Business Insider reports there are rumblings that the Army may not stand idly by and the possibility of a coup d'etat is raising its ugly head. While I believe that these risks will ultimately resolve themselves in a benign fashion, these stories are just further signs that the news cycle is turning negative in Europe. Questions about Italy. In the wake of the political paralysis created by the recent Italian election, anti-euro populist Beppe Grillo wants an online non-binding vote on Italy's membership in the eurozone. Stories like these serve the purpose of turning up the heat on the bulls and emboldens the bears. Recall that in 2011 we had angst over Greece and the implications for the eurozone. We saw endless summits and crisis meetings until the ECB stepped in to stabilize the situation. Today, the fragile peace that the ECB has put together is starting to unravel. Europe is in recession and the tone of the news stories are turning negative. These kinds of stories have a way of not mattering to the markets until it matters, especially when the market is in risk-on mode. Now that the tone seems to be moving away from a risk-on to risk-off, the market has a way of focusing far more on this kind of negative information. In 2011, the SPX cratered about 17% in response to these anxieties. While I am not saying that the downside could be the same, it is nevertheless a warning for the bulls. The key difference between the market weakness in 2011 and today is how the Fed acted then and now. In 2011, the Fed's QE program was just ending, while we are seeing QE-Infinity today. The actions of the Federal Reserve today may serve to cushion the effects of the speed bumps that the equity markets are likely to experience. Nevertheless, the current environment is likely to be more friendly to the risk-off crowd than the risk-on crowd.